For some time I had been interested in getting a backpacking wood stove. There are a number of different styles available on the marketplace and so I took my time deciding. I wanted something small, efficient, and reliable. Eventually, I decided on the Element by Tato Gear. I choose the titanium model, which weighs in at around 5 oz. It folds flat and can be assembled very quickly. The obvious contribution of a stove like this is its lightweight feature. Because it burns fuel that is gathered in the woods, there is no need to carry bulky fuel canisters. As well, wood stoves eliminate some of the dangers inherent to alcohol stoves, like knocking over a stove and spilling burning fuel over gear and flesh. The downsides are obvious, too. Wood stoves depend upon dry firewood. 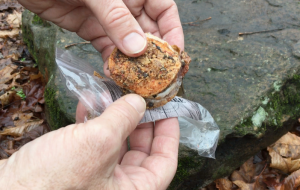 If you are hiking in wet weather or above the treeline, good fuel may not be available. 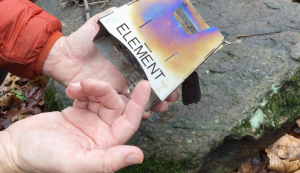 However, the Element stove can also be used as a windscreen for a small alcohol stove, which can be carried as a backup. Also, the Element takes more time. If you are planning an early, quick start to your day, then you may want to consider another type of cooking source. Recently, I took the stove with me on a day hike. Stopping for lunch, I decided to run a field test and make some hot chocolate. It had been raining for almost two days and I knew there would be a lack of dry firewood. Therefore, I took the new Sandy Cookie from Pine Fire Fatwood to give it my first field test. I’ve been using Pine Fire Fatwood for over a year now and am really impressed with its ability to jumpstart my campfires. The Sandy Cookie is one of their newest additions to the fire-making line. It is a compressed composite of fatwood sandwiched around a cotton pad. The Sandy Cookie is designed to ignite quickly like tinder and provide a sustained, hot burn in order to get your kindling and next fuel stage going. However, I’ve seen video reviews suggesting that the Sandy Cookie alone burns hot and long enough to bring several cups of water to a boil without the use of other fuel. I was able to locate some small twigs that were dry enough to burn. After erecting the stove, I broke up a few twigs for a base beneath the Sandy Cookie. Since I was only boiling around 1 cup of water, I separated the Cookie into halves. This exposed the dry cotton pad. Using my ferro rod and Mora knife, I was able to ignite the Cookie in one strike. I was very impressed. I moved the Cookie into the Element and stacked some small twigs on top. Within a few minutes I had an impressive flame. I failed to time the whole procedure, but one cup of water was brought to a boil within around 8 minutes. Adding no more fuel, the flame died out within 2 or 3 minutes after reaching a boil. Both the Element stove and Sandy Cookie performed very well. The Element will likely be part of my summer/fall backpacking gear, while the Sandy Cookie will be with me every time I plan on making a fire. These two great products are made in the U.S.A. and are produced by small businesses. Those are both very good reasons to give my support.